Through the power of oxidation, GreenClean Granular Algaecide breaks down algae cells on contact! Its unique, organic chemistry immediately begins fighting algae blooms and releasing vital oxygen into the water as it biodegrades. This solution can be used as a curative or preventative treatment in any water feature. Formulated without the use of harsh chemicals or chlorine, you will be worry free because nothing negative can effect your aquatic ecosystem. Trust GreenClean to immediately kill algae in any water feature around your home including ponds containing fish, plants, and aquatic life. GreenClean is an EPA registered, organic algaecide, so you can feel good about what is in your water. How Does GreenClean Granular Work? GreenClean is a granular algaecide with an activated peroxygen chemistry that works through a powerful oxidation reaction to break down algae cells on contact. An added benefit, the process releases oxygen into the water as it works to eliminate algae. I Have Fish In My Pond: Can I Use GreenClean? GreenClean will not harm fish or aquatic life. GreenClean once diluted in water is non-harmful to animals such as birds, bees, and pets. Can I Use GreenClean On My Waterfall? Yes, as a contact algaecide the granules need to make contact with the algae to be effective. Our recommendation for treating waterfalls is to turn the pumps off, apply GreenClean directly to the algae, and then turn them back on after 20 minutes. Will GreenClean Affect The pH Level? GreenClean will raise the pH up to 1 unit. Although this will comeback down on its own within about a week. Test pH prior to using and apply in the morning. GreenClean Tablets utilize an activated peroxygen chemistry, the same oxidizing formula as GreenClean Granular Algaecide, in a convenient tablet form. GreenClean Tablets are an essential part of a preventative, maintenance program against string and planktonic algae. It is the go-to product for pond owners who do not have time for difficult pond maintenance programs. GreenClean Tablets are free of chlorine, copper, and phosphates so they are safe to use in water features that contain fish, plants, and other aquatic life. *Please Note: The product is to be used as a preventative, not a curative solution. See GreenClean Granular for curative solutions. Fast acting algae control. 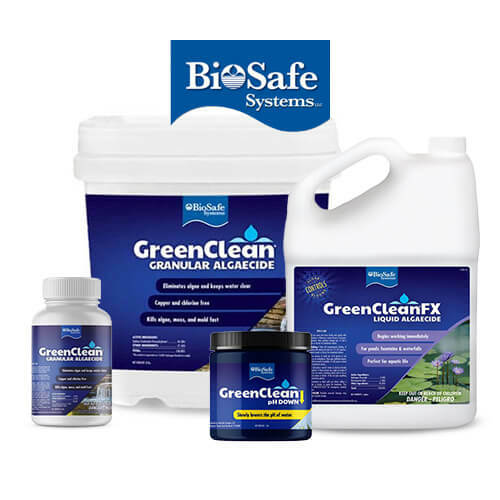 GreenCleanFX Liquid Algaecide is a highly effective and affordable solution to algae problems that plague a wide variety of backyard water features, including ornamental ponds, pondless waterfalls, and fountains. As an EPA-registered algaecide, it is compliant with the USDA National Organic Program regulations, making it safe for use in water features containing fish, plants, and other aquatic life. Apply early in the morning under sunny, calm conditions. Measure the pH of water before treatment. If pH is below 7.0, adjust the water pH to between 7.0 and 8.0. Distribute recommended dose as evenly as possible to several areas around the pond so product evenly disperses. It may also be mixed in a bucket of pond water and evenly distributed around the pond. Do not shut off pump(s) or aeration device(s); aeration must be continuous during treatment for 48 hours. Repeat dose every 3 days until algae is under control. Removing excessive algae growth will reduce the amount of decaying organic matter in the pond. Can be applied in Water Containing Fish & Plants. Treats, controls, and prevents string algae and green water algae without harming pets, fish, plants or aquatic life. Adds beneficial bacteria reducing ammonia, nitrites and excess nutrients. 68 strains of highly concentrated beneficial bacteria for faster activation. Higher strain count than other liquid bacteria products making it more powerful. No odor like in other liquid bacteria products. 16 and 32 oz bottles with no mess measuring spout. C16004 - GreenClean Team, Algaecide 8 lb + Xtreme 1 gal. C16002 - GreenClean Team, Algaecide 20 lb + Xtreme 1 gal. C16001 - GreenClean Team, Algaecide 50 lb + Xtreme 1 gal. GreenClean pH UP and GreenClean pH DOWN optimize the pH balance in water features and small ponds so ecosystems can thrive. Maintaining a neutral pH level will promote fish health, clear water, and plants. Adjustments to pH should be done slowly and over a period of time, which is simple to accomplish with the GreenClean line's dry formulation that is easy to measure and apply. GreenClean pH UP raises low pH levels in water gardens and small ponds to an optimal neutral range allowing beneficial bacteria a healthier environment to thrive in. A neutral pH level means healthier fish, aquatic plants, and pond ecosystem. GreenClean pH DOWN lowers high pH levels in water gardens and small ponds to an optimal neutral range allowing beneficial bacteria a healthier environment to thrive in. A neutral pH level means healthier fish, aquatic plants, and pond ecosystem. Use 2 tablespoons for every 500 gallons of water. Check the pH level 24 hours after adding (Down) to ensure that pH levels are within normal range. If pH levels are not within normal range repeat step one. Use 2 tablespoons for every 500 gallons of water. If pH level is below 6.8, use 4 tablespoons per 500 gallons of pond water and check the pH level 24 hours after adding (UP) to ensure that pH levels are within normal range. If pH levels are not within normal range repeat step one. GreenCleanO2+ is a slow release granular for use in any water feature, especially those including fish, plants, and other aquatic life. Oxygen is a necessary component to any balanced water features, assisting in maintaining water quality and clarity. GreenCleanO2+ keeps fish happy when water temperatures are high and oxygen levels are low. Apply 1/4 cup (4 tablespoons) per 500 gallons of water upon start up. Apply two (2) tablespoons per 500 gallons of water once per month after initial treatment.